Recent reflection on technology-enhanced learning and teaching suggests a key design principle, that “Learners can be active makers and shapers of their own learning. They should be supported in using technologies of their own choice where appropriate” (JISC, 2009, p. 51). Learners might choose technologies that are familiar to them and that they have used successfully in the past. This could include mobile devices, although for many people such a choice would be a departure from their usual practice of using mobile phones and other portable devices for personal and social reasons, rather than learning. That is why the circumstances in which learners decide to use a mobile device, for learning and for other aspects of their lives, are worth investigating. It has been shown that an everyday tool such as the mobile phone will not necessarily be readily adopted for learning; a variety of barriers to adoption continue to be identified, such as ergonomic, pedagogical, psychological and environmental factors and the issue of cost (Stockwell, 2008). At the same time, it is clear that some barriers are local, temporary and may be overcome. For example, since mobile device users are driving the proliferation of free Wi-Fi hotspots in parts of the world (Bradford, 2010), cost issues could become less of a barrier, and we can speculate that more widespread adoption by students and teachers is likely to follow. 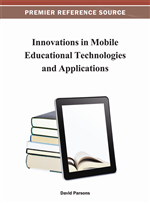 Furthermore, the increasing availability of free or inexpensive ‘apps’ (applications) for mobile phones is also spreading the message that the phone can be used as a convenient and powerful tool for learning. Due to the rapidly changing landscape of technology use, there is a continual need to understand learner practices and their technology adoption, including any new barriers and enablers that can be identified. In an age when “communities are jumping across technologies” as needs and trends evolve (Wenger, 2010), educators and researchers also have to stay informed about how learners use personal technologies as members of communities that may be social, work-related or educational. Communities and networks facilitated by technology are, in turn, the means by which various technologies are promulgated and adopted; for example, when social network sites add real-time communications features such as instant messaging (Christakis & Fowler, 2009). Our research is situated within emerging research on the ‘learner’s perspective’ on e-learning and mobile learning, in the context of increasing learner autonomy, personal choice of tools and learning spaces, and decreasing institutional control. It also contributes to debates engendered by the idea that education must change in response to a new generation of learners. Typically the ‘new generation’ is understood as comprising those born in the period since the early 1980s, variously referred to as the Net generation (Tapscott, 1998, 2008), Digital Natives (Prensky, 2001, 2009) and Millennials (Oblinger & Oblinger, 2005), whose expectations in respect of technology use are claimed to be significantly different from the generations that preceded it. Jones, Ramanau, Cross and Healing (2010) have critiqued the ‘new generation’ arguments, concluding that “overall there is growing theoretical and empirical evidence that casts doubt on the idea that there is a defined new generation of young people with common characteristics related to their exposure to digital technologies and networked communication throughout their lives” (p. 6). Instead, their research points to the existence of a number of notable ‘minorities’ within the generation, such as “a large minority who make use of the Internet to download or upload materials and a smaller minority who contribute to blogs and wikis or engage with virtual worlds” (p. 21). Within their sample of First Year university students in the UK, almost all students owned a mobile phone; an mp3-device or other digital music player was commonly owned as well, but the use of these portable devices was not explored in any detail. Conole, de Laat, Dillon and Darby (2008) found that students made use of mobile phones frequently to phone and text each other, particularly when they had assignment queries.